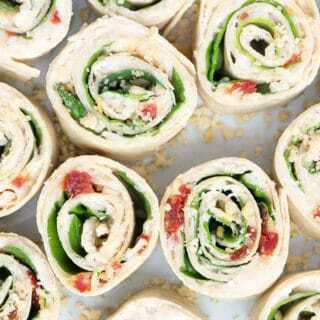 Lunch or appetizer - these vegan pinwheels are layered with white beans, sun dried tomatoes, basil and pine nuts. Blend all ingredients for white bean spread together in a Cuisinart until smooth like hummus. Season with more salt and pepper to taste. Mix in the crushed pine nuts into the spread by hand. Place three tortillas on a flat surface and evenly divide the white bean spread between the 3 tortillas. Spread the mixture to the very edges of each tortilla. This the glue that is going to seal the roll ups so it's important to get it to the edges. Lay the chopped sun dried tomato pieces, basil and spinach leaves flat over every inch of each tortilla EXCEPT for about 2" on one side - that needs to remain uncovered so that the end of the tortilla roll up will stick together. Press leaves down slightly before rolling to make sure everything sticks. Roll each tortilla up as tightly as you can - rolling towards the uncovered edge. Refrigerate until ready to serve or cut into 2" pin wheels and serve immediately.